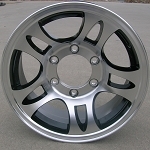 15" Aluminum 7 Spoke Wheel. The exact size is 15" x 6" 6 lug on 5.5" bolt pattern. Center hole diameter is 4.25 inches. Max load is 2830 Lbs per wheel. Steel Inserts - Steel sleeves are pressed into the lug holes of this wheel. This listing is for the wheel only. Most common tire sizes mounted on this wheel are 205/75R15, 205/75D15 (F78-15), 225/75D15 (H78-15) and 225/75R15. 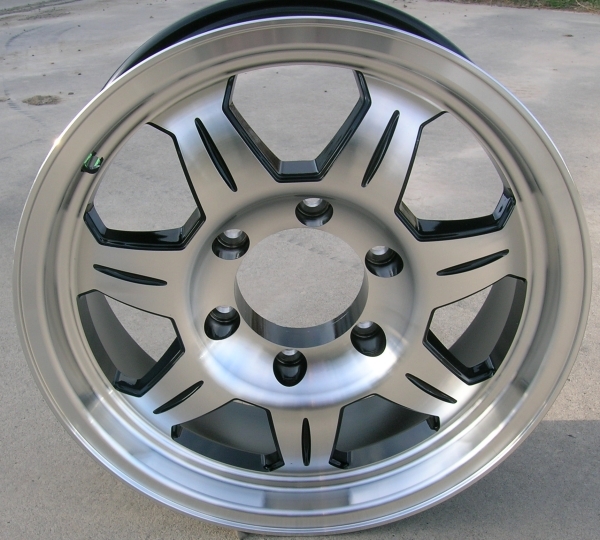 If ordering center caps for this wheel we recommend the "4.25" Chrome Center Cap AWC EZ-Lube." We ordered 4 of these wheels for our camper and we love them. Good quality, very stylist and price was good. We have already had them put on our camper and it looks new!